The NEST Fragrances Collection combines color, texture and fragrance to enhance your everyday living and entertaining experience. The glass vases are designed to complement the beauty of its surroundings; the classic shape and modern stripe etching will complement any décor. Each of the fragrances has been created by the most accomplished perfumers at the world's leading fragrance houses. Warning: Never leave a burning candle unattended. Candles should always be placed away from flammable materials. Keep out of reach of children and pets. Please remove from the box before burning. Trim wick to 1/4 inch before lighting. Keep all objects, including matches and wick trimmings, out of the candle. Do not burn for more than 3-4 hours at a time. The container will be hot when the candle is lit. Failure to follow these instructions can result in personal injury and/or property damage. FDA cosmetic grade ingredients - paraffin blend, palm oil, soy wax, natural oils and fragrance. Collaborating with some of the world's finest perfumers, NEST's home fragrance collections are created with a luxurious, but everyday feel. The proprietary wax formulations ensure that our candles burn evenly and infuse a room with fragrance. 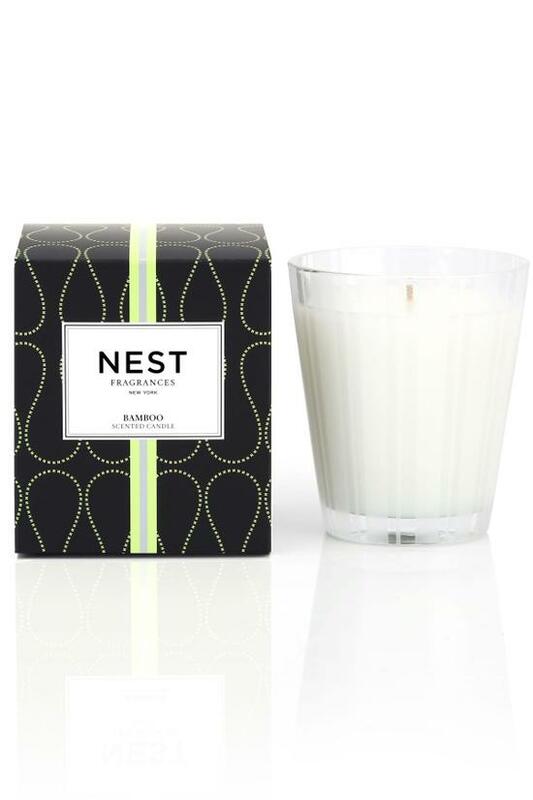 Simple, yet elegant packaging make NEST home fragrance products perfect for any décor and taste.